✺ LUULI ≜〔USA〕4 HOUR LIVE RITUAL!! As Metacore Festival we have nice underground gatherings with different crews from around the world! 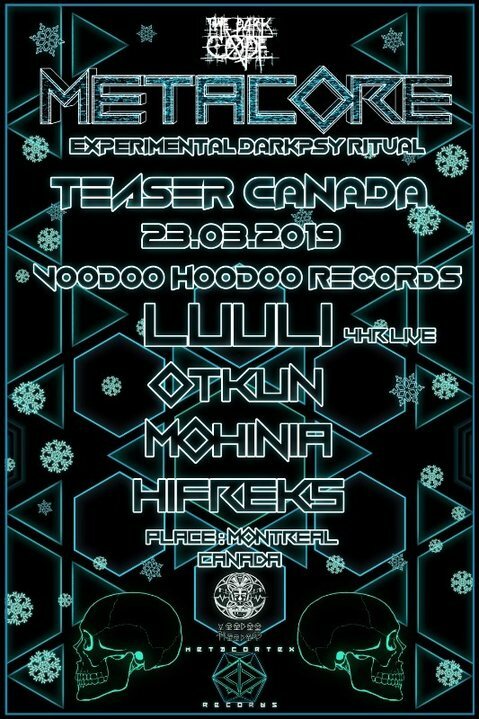 Here our next teaser with Voodoo Hoodoo Records in Canada! We have amazing collaboration with Voodoo Hoodoo Artists and records in Metacore Festival 2019! We will have 4 hours crazy Luuli ritual in Metacore Teaser Canada !!! Also amazing sets will come from Otkun, Mohinia and Hifreks! Thanx to Voodoo Hoodoo and the artists for their support and make this killer event happen! Dont miss this special gathering!!! In this parties you can buy your Metacore 2019 Festival tickets from our team from pre-sale prices! Hope to meet and have a winter ritual in this pre-events!